Although you might not realise it, Terrazzo has been at the forefront of style and design for decades. 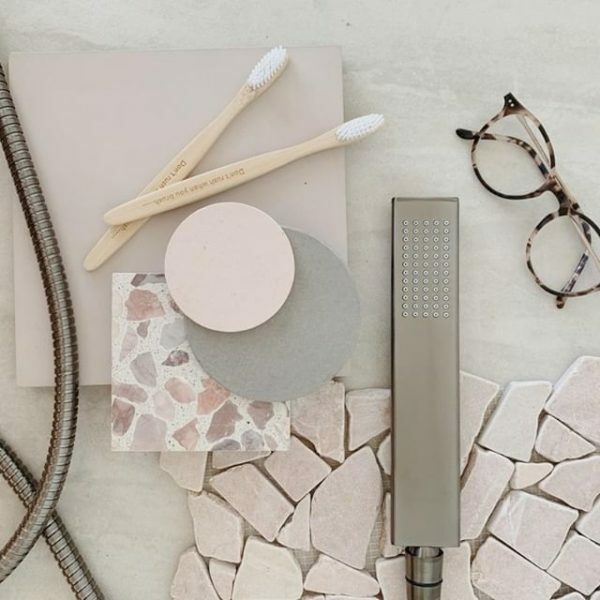 Once relegated to shopping centre bathrooms and floors, Terrazzo has been catapulted into 2019 with a revival of this unique element. We’re here to show you why it has stood the test of time, and more importantly, how to incorporate it into your home! Thanks again Italy, for another amazing design element. They started it all by using fragments of marble, granite and quartz set into concrete. Then went about grinding and sanding it, until it became smooth and shiny. And hey presto – Terrazzo was born! Used then for mainly decorative purposes, it has evolved into a more versatile product that can be used on walls and floors throughout the home. Whilst the manufacturing has come a long way, true Terrazzo is still very labour intensive and can be quite costly. However, we love it for it’s durability, design options, and of course it’s beauty. It is waterproof once sealed, which makes it an amazing option for spaces like the bathroom. If used throughout the home as a flooring option, this will bring continuity of your style and keep your spaces connected. As Terrazzo can feel quite cold underfoot, you might also like to include the use of rugs. This can help to create a sense of warmth and texture in places such as the living room and bedrooms. Due to the other elements added to the concrete, it usually require underfloor heating in colder locations. You might feel that the initial cost of a genuine terrazzo floor is relatively high, but it’s there for the long haul. Not only will it wear extremely well, even in high traffic areas, you can also grind it again and restore it back to brand new! If you are looking at having authentic Terrazzo installed in your home, just be mindful of the installation time. It can take up to 5 weeks to fully complete a genuine Terrazzo floor. If you’re creating your forever home, this could be an amazing option for you. However, if you are planning a reno or just updating a certain area of your house, the good news is that you can now buy Terrazzo tiles! These tiles look and feel amazing…With a soft feel underfoot, beautiful colour options and a detailed look, this element is sure to bring interest into any space. Terrazzo is now available in almost ANY colour that you like! Because you’re not limited to cement with neutral colours – maybe try something different. What about bold, dark, trending colours? Versatile and adaptable, this is sure to be the focal point where ever you decide use it. Try and incorporate a colour in your Terrazzo, that will also echo the other design elements in the space. For example, if you are using matte black tapware, ensure there is a touch of black throughout the tile you choose, just to tie into your overall palette. It’s confirmed…We know that our love of Terrazzo is going to continue for many decades to come. So if you are looking for a timeless element for you home, give Terrazzo a chance. It’s definitely something unique and very versatile. What has us even more excited, is the fact that the applications for where and how it can be used, are growing and growing! This beautiful, functional element is definitely here to stay and we couldn’t be happier. Would you consider Terrazzo as your next big thing?